Born Robert James Brown on October 28, 1948 in Winnsbore, South Carolina. Parents James and Versa Brown moved to Dayton, Ohio in 1954 where Robert graduated from Roth High School. He received his calling at the tender age of 5 years old and continued to journey through life’s trials listening to the voice of the Lord. 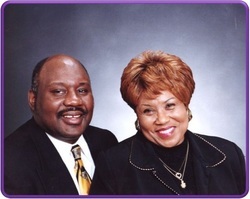 In 1984, Robert obeyed the voice that he had heard for so long and rededicated his life to the Lord under the direction of Pastor Ed Ralston (First Pentecostal of Murlin Heights), his spiritual shepherd After 7 years he was lead to United Missionary Baptist Church where he met his helpmate, the former Ms. Rosa White, who became Mrs. Rosa Brown on May 29, 1993. Robert was ordained to preach the gospel in 1994 at which time he also enrolled in Bible College. He continued on his educational journey receiving his Bachelors Degree in Bible Study, Master of Divinity, and Doctorate in Bible Theology. He has also received his Pastoral Educational Training through the Kettering Network. His community involvement includes Presidency of Spirit of Peace CDC and the Vineyard CDC. Dr. Brown has three children Kobi Cooper, Kachema Woodruff, and Jason Brown and he also has seven grandchildren. Dr. Brown lives by example Mathew 6:33: Seek Ye First The Kingdom of Heaven. He dedicates his life to save and deliverance ministry and will continue to work without compromising the infallible Word of God.